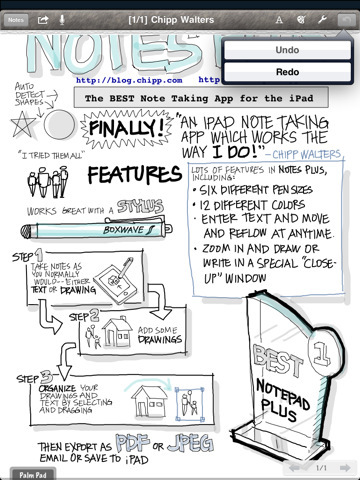 It’s no secret that the native iPad Notes app is wildly insufficient for anything but the odd note. 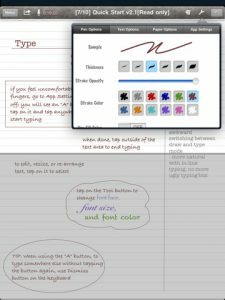 Thankfully, there are alternatives available like Notes Plus – Handwriting, Typing, Shape Drawing and Sound Recording from Viet Tran that vastly expand the note taking power of the iPad. To start typing with Notes Plus all you have to do is tap the screen with two fingers. 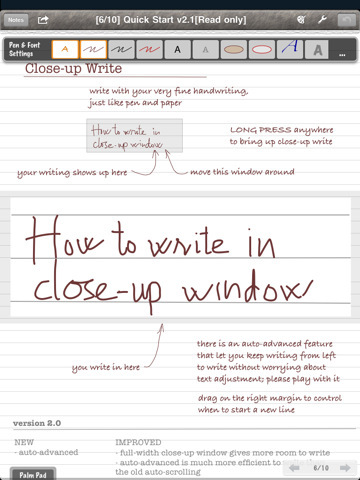 If you want to make a handwritten note you can put finger to screen immediately and the app will smooth out your text. 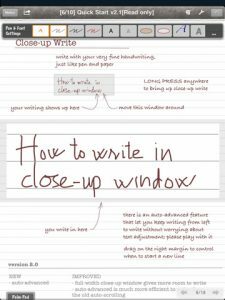 You can pinch to zoom in on the note so that you can achieve smaller handwritten text, and uses two fingers to scroll across the page. With Notes Plus you can draw a circle around text to select it, then tap and hold to drag the text. Notes Plus features auto shape detection and if you draw a circle, triangle or rectangle on the note a smooth-lined shape will be laid down of the size you specify. This shape recognition enables you to easily create text boxes to help separate your notes. There are several options for editing both handwritten and typed text. You can change line thickness, stroke opacity and stroke color for your handwriting and change font type and color for typed text. You can also change the paper type, from ruled to grid to plain. A unique feature – the palm pad – allows you to create an area on the screen where you can rest your palms while writing/typing so you don’t get any accidental strokes. It’s a nice touch. Notes Plus also allows voice recording so you will never miss any important information at your next interview, meeting or lecture. Simply tap on the microphone symbol to being recording and tap on it again to stop. Voice recordings are attached to pages and a play button will appear if there is a recording on a particular note. 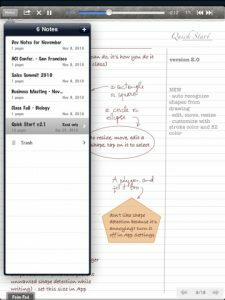 Once you’ve made your notes, you can export to PDF, email PDF or upload to Google Docs, giving you flexibility in how you share and distribute your notes. The recent version 2.1 update has introduced a number of export features, and you can now export as images to email Evernote, as a single PDF page or you can save your notes to a photo album. 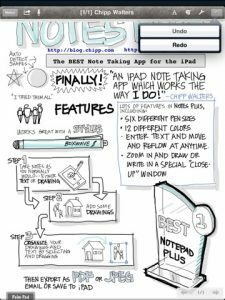 Bottom Line: Notes Plus for iPad is a full-featured note taking app that offers a lot more note-taking power than Apple’s default Notes app. For just $0.99, Notes Plus offers exceptional value if you need to take detailed notes on-the-go.